Bättre Lyss-Till Den Sträng Som Brast Än Att Aldrig Spänna En Båge. Release Date: ‘16th’ March 2018. When the Swedish band Bättre Lyss released their debut album Till Den Sträng Som Brast Än Att Aldrig Spänna En Båge as a private pressing on the Musiklaget label in 1975, they had no idea that five decades later this psychedelic hard rock and progressive album would be a cult classic that regularly changes hands for $150. This meant that that Till Den Sträng Som Brast Än Att Aldrig Spänna En Båge is beyond the budget of most record buyers, who want to discover Bättre Lyss’ groundbreaking debut album. Not any more, as the Sommor Records label, which is an imprint of Guerssen Records, will reissue Till Den Sträng Som Brast Än Att Aldrig Spänna En Båge on LP and CD on the ‘16th’ of March 2018. It’s a welcome reissue of an album whose roots can be traced to 1973. That was when two friends decided to write some songs together. Rolf Hammarlund was a bassist and vocalist, while Christer Palmquist was also a singer who played acoustic guitar and piano. Initially, the pair began writing songs in English, but after a while, they decided to change the lyrics to Swedish. When the pair looked back was a crucial decision. Before long, the pair had already written Göta Lejon together, while Rolf Hammarlund had penned Sagan Om Viggen, Tredje Rike and Chaú Gaí. Meanwhile, Christer Palmquist had written Drömflickan, Vapnet and Ansvaret. These songs weren’t the throwaway pop songs that featured in the charts across Europe. Instead, the songs were cerebral and thought-provoking, dealing with subjects like the Vietnam War, the Chilean coup d’état, poverty, homelessness and alcohol addiction. By then, two had become three. Not long after starting to write in Swedish, Rolf Hammarlund and Christer Palmquist were joined by another mutual friend, songwriter and drummer Rolf Johansson who wrote Emma and K-E Andersson. By 1974, the trio had nearly written enough material to record an album together. That was when the three friends started thinking about recording their debut album. To do that, would require the help of some of the trio’s talented friends. This included guitarist and pianist Anders Nordh who had previously been a member of Life, and released two albums with the band. Since the demise of Life, Anders Nordh had embarked upon a solo career, but was keen to join the nascent band. He was joined by another two guitarists Knutte Knutsson and Bo Klackenberg. The plan that had already been put in place was for the new group to feature a triumvirate of guitarists. They were joined by organist Bo Wieslander and flautist, clarinetist and soprano saxophonist Ulf Nordin. Adding backing vocals were Gunilla Ericson, Kerstin Backman and Kristina Näsström. The lineup of the band that eventually became Bättre Lyss was in place. Now Bättre Lyss started honing their sound and practising the nine new songs. Soon, nine became eleven when Rolf Hammarlund, Christer Palmquist and Anders Nordh completed Vidsel-Sthlm, Enke. Rolf Hammarlund and Christer Palmquist also wrote Anna with backing vocalist Kerstin Backman. With the addition of the two new songs Bättre Lyss definitely had enough material for their debut album. When recording of Till Den Sträng Som Brast Än Att Aldrig Spänna En Båge began, drummer Rolf Johansson joined bassist Rolf Hammarlund in the rhythm section. Meanwhile, Christer Palmquist played acoustic guitar and piano, and also took charge of lead vocals. He was joined by the triumvirate of guitarists Anders Nordh, Knutte Knutsson and Bo Klackenberg. They were augmented by organist Bo Wieslander and flautist, clarinetist and soprano saxophonist Ulf Nordin while Gunilla Ericson, Kerstin Backman and Kristina Näsström added vocals. Soon, Till Den Sträng Som Brast Än Att Aldrig Spänna En Båge took shape and before long, the album was completed. Now that Bättre Lyss had completed Till Den Sträng Som Brast Än Att Aldrig Spänna En Båge, they decided to release the album as a private pressing. In 1975, the Musiklaget label released Till Den Sträng Som Brast Än Att Aldrig Spänna En Båge which marked the debut of Bättre Lyss which featured psychedelic hard rock and was a progressive album that sometimes headed in the direction of blues rock and folk rock. Sadly, being a private pressing, Till Den Sträng Som Brast Än Att Aldrig Spänna En Båge didn’t reach the wider audience that the music deserved. Bättre Lyss make an impression as the progressive psychedelic hard rock of Göta Lejon opens Till Den Sträng Som Brast Än Att Aldrig Spänna En Båge. Thunderous drums and washes of swirling Hammond organ are joined by scorching, blistering guitars as Christer Palmquist unleashes a powerful vocal. By then, it sounds as if Bättre Lyss have been influenced and inspired by Deep Purple, Led Zeppelin, and sixties psychedelia. Midway through the song, it’s all change and it becomes a tender piano led ballad. Later, Bättre Lyss pay homage to Jethro Tull when a flute replaces the vocal and the band play within themselves. Later, a scorching guitars takes centre-stage and crunch guitars and the rhythm section drive the arrangement along and in doing so, sets the bar high for the rest of the album. As Christer Palmquist’s vocal is counted in on ballad Emma, he plays the acoustic guitar and the song heads in the direction of folk. Soon, a piano and weeping guitar enter, adding a country rock influence. However, before long a scorching guitar and the rhythm section combine with the piano and Christer Palmquist’s vocal. He and the rest of Bättre Lyss showcase their versatility on another carefully crafted song that shows another side to this truly talented band. Straight away, there’s a element of urgency as the piano is soon joined by a blistering guitar and the rhythm section. This urgency is reflected in Christer Palmquist’s vocal while crunch guitars add a degree of urgency, and soon, what sounds like a siren can be heard. Meanwhile, the piano continues to play a leading role, before the guitars explode, and are panned left and right while adding to the drama of a this progressive sounding track as it builds. Meanwhile, the vocal veers between tender and powerful as rocky guitars accompany it, before reaching a crescendo. Anna is a piano led ballad where the rhythm section provide the heartbeat while Christer Palmquist adds a tender, heartfelt vocal. Later, guitars interject, before a searing guitar solo replaces the vocal at 1.35. It takes centre-stage and is the perfect replacement for the vocal, which returns at 2.10. With just the piano and rhythm section for company, Christer Palmquist breaths life and meaning into the lyrics in this beautiful ballad. Sagan Om Viggen opens with dual rocky guitars ringing out before the rhythm section make their presence felt. Meanwhile, Christer Palmquist’s vocal is a mixture of power and urgency. When it drops out, scorching guitars fill the void. When he briefly returns, his vocal is impassioned before the guitars replace him. They’re much more understated, but still play a leading role as the rhythm section power the arrangement along. Eventually, the guitars grow in power and cut through the arrangement before soaring high. They remain when the vocal returns in and help drive this rocky arrangement along before it briefly takes on a melancholy sound. Soon, though, this roller coaster of a track becomes rocky, dramatic, progressive, psychedelic and anthemic. Rueful describes Drömflickan as guitars chime and almost weep before Christer Palmquist’s tender, wistful and sometimes lysergic vocal enters on this short track. It lasts just 1.31 but is beautiful, melodic and memorable. Very different is Vapnet, which has a dark, dramatic and hard rocking sound. Bättre Lyss’ rhythm section and blistering guitars unite to create a rocky backdrop. However, when the piano enters and ushers in Christer Palmquist’s vocal it’s all change. Briefly, there’s a nod to Queen, before the arrangement builds. Scorching guitars and a bass cut through the arrangement, and when the vocal drops out, it becomes progressive as it skips along. Then when Christer Palmquist’s vocal returns, he adds to the earlier theatre as elements of Led Zeppelin, Deep Purple, Queen and early seventies progressive rock combine to create a heady musical brew. Later, guitars and saxophone enjoy their moment in the sun as Bättre Lyss continue to showcase their skills during one of the most ambitious and progressive tracks on the album. Tredje Riket is another piano led track where Christer Palmquist delivers a tender, emotive vocal before the rhythm section and scorching guitar are added and the arrangement builds. Later when the vocal drops out, the rhythm section anchor the arrangement and continue to provide the heartbeat as the piano and guitar enjoy their moment in the sun. As Rolf Johansson pounds his drums, this is the signal for the impassioned vocal to return. It’s joined by harmonies while a guitar cuts under the arrangement to this ballad becomes anthemic. Bättre Lyss haven’t spared the hooks on what’s one of their finest moments. Just an acoustic guitar opens on the ballad Ansvaret before the rhythm section are joined by a blistering guitar solo which is replaced by Christer Palmquist’s vocal. It’s full of emotion as backing vocalists accompany him. Later, when his vocal drops out it’s replaced briefly by a guitar before the vocal is panned hard left, and soon the backing vocals are panned hard right. Gradually, they move back to where they started as the rest of Bättre Lyss play their part in the sound and success of the song. Blistering rocky guitars sit above the rhythm section and piano on Chaú Gaí, but drop out at 0.22. They’re replaced by acoustic guitar and Christer Palmquist’s vocal while the piano plays a more prominent role in this progressive track. Soon, harmonies accompany the vocal before searing guitars return. They accompany the vocal and add a contrast as this carefully crafted track continues to unfold and reveal its secrets. Meanwhile, Bättre Lyss showcase their talent and versatility, as seamlessly switch between and combine musical genres during another the album’s highlights. Closing Till Den Sträng Som Brast Än Att Aldrig Spänna En Båge is K-E Andersson where an acoustic guitar ushers in a confident vocal. After the briefest of pauses, a scorching guitar and the rhythm section enter and accompany Christer Palmquist’s vocal. Later, a clarinet enters and although it’s not usually an instrument that features on rock albums it plays a part in this catchy and memorable track where elements of folk, rock pop and rock combine seamlessly. In doing so, they ensure the album ends on hook-laden high. After eleven tracks., lasting just over thirty-six minutes, Bättre Lyss’s groundbreaking and genre-melting magical mystery tour Till Den Sträng Som Brast Än Att Aldrig Spänna En Båge is over. This talented and versatile Swedish band switched between and combined elements of hard rock, psychedelia and progressive rock and also added elements of blues rock, country rock, folk rock and pop during Till Den Sträng Som Brast Än Att Aldrig Spänna En Båge. The result was a carefully crafted album that stands head and shoulders above many of the other rock albums released as private presses in Europe during the first half of the seventies. 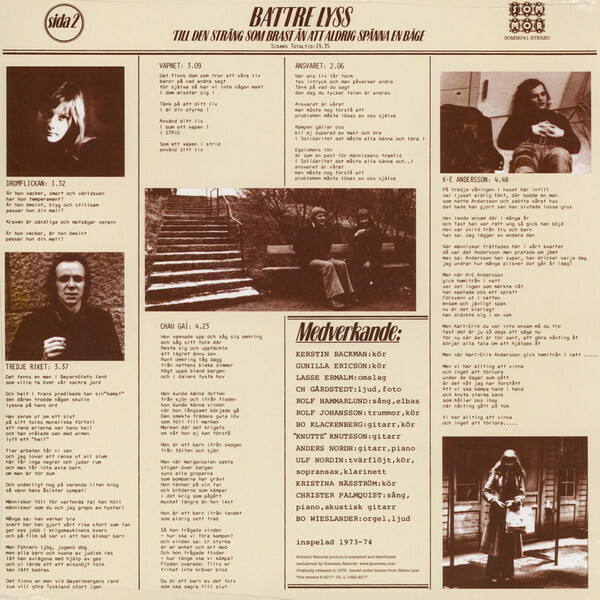 Sadly, by releasing Till Den Sträng Som Brast Än Att Aldrig Spänna En Båge as a private pressing this meant that only a small number of Swedish record buyers were able to hear what was Bättre Lyss’ one and only album. Maybe if Bättre Lyss had tried to interest a major label in the album, the band would’ve gone to greater things? Bättre Lyss were fortunate to have a trio of talented songwriters Rolf Hammarlund, Christer Palmquist and Rolf Johansson who wrote most of the songs on Till Den Sträng Som Brast Än Att Aldrig Spänna En Båge. These songs were brought to life by this talented and versatile band who should’ve gone on to greater things. Alas, that wasn’t the case and Till Den Sträng Som Brast Än Att Aldrig Spänna En Båge was the only album that Bättre Lyss released during their short career. Five decades later, and Till Den Sträng Som Brast Än Att Aldrig Spänna En Båge and is a cult classic which changes hands for anything up to $150, which meant the album was beyond the budget of most music fans. Thankfully, Sommor an imprint of Guerssen Records, will reissue Till Den Sträng Som Brast Än Att Aldrig Spänna En Båge on LP and CD on the ‘16th’ of March 2018. This is the perfect opportunity to discover the delights of Bättre Lyss’ genre-melting debut album which is a heady and tantalising music brew from one of Sweden’s great lost groups. ← EVA SALINA AND PETER STAN-SUDBINA: A PORTRAIT OF VIDA PAVLOVIC.